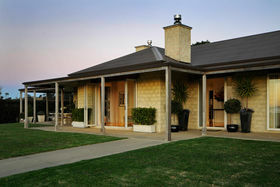 Alan and his wife Virginia have been living in the Franklin District since 1990 having returned from Australia where Alan held various senior marketing positions with Qantas. Alanâ€™s â€˜claim to fameâ€™ during 16 years at Qantas was the â€˜I Still Call Australia Homeâ€™ television advertisements that were used by Qantas in 144 countries (and still going) and the Qantas Frequent Flyer Scheme. Like all good Kiwis, Alan and Virginia returned home to start a family and purchased Claremont Gardens in Jericho Road, Pukekohe East. Four acres of country garden, with 400 old English roses, that was open to the public. An import / wholesale business in gift and homewares was established, which ran from a warehouse on the property. Their pre-Christmas sales at the Puke East Hall were â€˜legendaryâ€™ and that led to opening of the Going, Going, Gone outlet stores at Dress-Mart in Onehunga and Wellington. Nine years later the family, now with two children, moved into Ramaramaâ€™s Martyn Farm Estate. Alan went to work with Possum Bourne handling his marketing and three years later it was all over. Alan then teamed up with racing driver Matt Halliday and successfully managed Mattâ€™s and others, sports media and sponsorship. That was of course until the recession of 2008/2009 hit sports sponsorship hard. Alan saw this as an opportunity to follow another of his passions, that being Real Estate. With over 30 years of involvement in Real Estate including several lifestyle sales and purchases, a large holding subdivision, a beach subdivision and the construction of a dwelling, coupled with his vast marketing background Alan started his Real Estate career with considerable knowledge.